The award winning screenwriter scripting a movie on the life of Steve Jobs has revealed that the entire film will consist of three scenes that will take place before the unveiling of the original Mac, NeXT, and the iPod. Aaron Sorkin revealed the details of his script in an onstage interview at Newsweek and The Daily Beast's Hero Summit. Sorkin told editor Tina Brown that his film will consist of three scenes each about a half-hour in length. Those scenes will occur in real-time, suggesting they will show fictionalized accounts of Jobs backstage before the start of one of his iconic keynote presentations. Newsweek CEO Baba Shetty added that Sorkin said the three product launches featured in the movie would be the Mac, NeXT, and the iPod. Sorkin also revealed that Jobs would call him from time to time to compliment the screenwriter on something the Apple co-founder had seen and enjoyed. Jobs even asked Sorkin to write a Pixar movie once, but the Oscar winner declined. 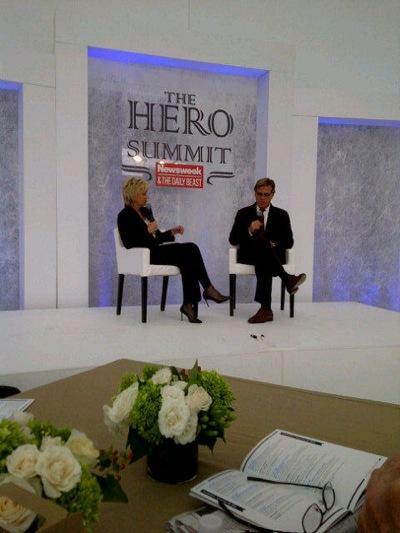 Aaaron Sorkin with Tina Brown at The Hero Summit, via Roger Wildermuth. Sorkin also discussed his script writing process, and said he strives to show audiences what a character wants, rather than who a character is. As for Jobs, he said there would be "no point" in writing something about him if he wasn't a flawed person. Sony Pictures Entertainment tapped Sorkin to script a movie on the life of Jobs in May after the studio optioned the rights to Walter Isaacson's biography. Sorkin won an Academy Award for Best Adapted Screenplay for his work on The Social Network, a film about Mark Zuckerberg and the creation of Facebook. Sorkin revealed in May, as he was still in the beginning stages of the script, that he envisioned the movie as more of a painting than a photograph reflecting the life of Jobs. He also said he wanted to avoid the "cradle-to-grave" narrative that naturally comes from adapting a biography. "I'm probably going to instead identify the point of friction that appeals to me and write about that," he said at the D10 conference. He also described Jobs as "an extremely complicated guy." In addition to The Social Network, Sorkin's credits include A Few Good Men, The American President, The West Wing, Sports Night, Studio 60 on the Sunset Strip, Charlie Wilson's War and Moneyball.